« Countdown to Thanksgiving – 3 days left! Countdown to Thanksgiving – 1 Day left! With tomorrow being Thanksgiving, I’m sure you’ve gotten all your big stuff – turkey, sides, desserts – as prepped as they can be. You may even have your house cleaned and table set. Today’s post is about the little things that you may want to add to make Thanksgiving day even more special and entertaining. If you have a seating arrangement for your gathering, instead of traditional place cards, why not do something a little more Thanksgiving-y. 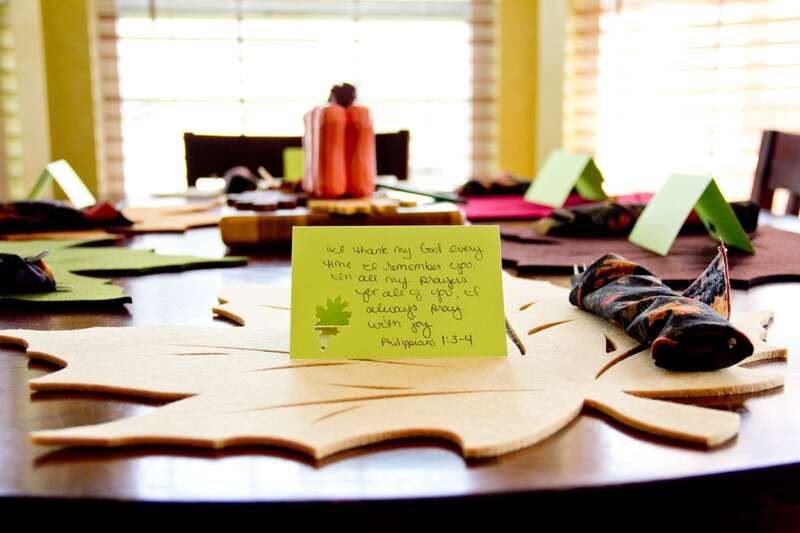 For example, put a different Bible verse about thankfulness at each place setting. Or, under the person’s name, write something you’re thankful for about them! Why not fill some of the time you’re not eating delicious food with games? Try the Thanksgiving Trivia sheet or Turkey Trivia. Set out a turkey coloring sheet and crayons for a craft that requires minimal adult supervision, or, for something requiring a little more adult assistance, try the Grateful Turkey! For more Thanksgiving ideas, check out our Pinterest board, The Pilgrim’s Hat!